Everywhere I went in the first half of November – Melbourne, Adelaide, Alice Springs, Cairns, and Sydney – Christmas decorations were springing up. In Australia there’s no Thanksgiving to buffer the way into the holidays. All the sparkle and flash of the upcoming season suddenly hit me. Hard. But it had no spiritual significance to me. I’ve always wanted something in my life to mean more, to mean everything. To be sacred. The closest I ever get to sacred is when I’m hiking. Especially in mountains. Or by the sea. Walking where people have walked for eons. To me, rock that’s been tread down, paths worn bare, and ancient places that have drawn wanderers forever, are holy. It took all of Day 10 to travel by bus from Alice Springs to Uluru aka Ayers Rock, a big rock in the middle of the desert. I was bummed because I’d dressed expecting sun and heat. But it was raining. Drizzling on and off. Downright gloomy. Just my luck to come to the desert in Australia in late spring-almost summer, and it rains. From a distance, the rock looked like a massive meatloaf. Only majestic. Monumental. Mesmerizing. Even from far off, the sandstone monolith seemed to have some ancient mystical spirit pulsing within. Nothing else was anywhere near. How could that rock NOT be sacred to the indigenous Anangu, or to anyone in this desert? “The home of the culture of the world’s oldest culture, it means everything to the indigenous people,” said the literature we’d been handed. We were to watch the setting sun bounce rays off the rock’s surface. Only – there was no sun. It was cold and dismal. Still, we “rugged up” in every bit of warm clothing we could find, and headed out on the bus. “You never know what you’ll get,” our tour leader said. At the site it was pouring. I pulled up my hood and hurried to the huge tent that had been set up over tables of champagne, smoked salmon, veggies with dip, cheese and fresh fruits. At least I wouldn’t go hungry. Along with hiking, food is my religion. I stuffed myself, and hardly looked at the sacred Uluru rock. Until somebody yelled, Miracle! Gulping down the champagne, I grabbed a last piece of salmon. Outside people were hollering, “Double rainbow! Over the rock, it’s a miracle!” I crept out of the tent and joined the crowd that was now scrambling every which way in the finest drizzle, to capture rainbows on cameras and cellphones. An eerie light lit up the rock and the landscape around it. Two rainbows ended at the rock. The sacred place. I stood there trying to focus my camera, through tears. Remembering how rainbows meant everything to my girl. My Marika. Who I pray to, now. Who I’d asked ten days before, “You’re coming with me to Australia, right?” Who is forevermore, Somewhere Over the Rainbow. What is sacred to you? What do you look for when you travel? 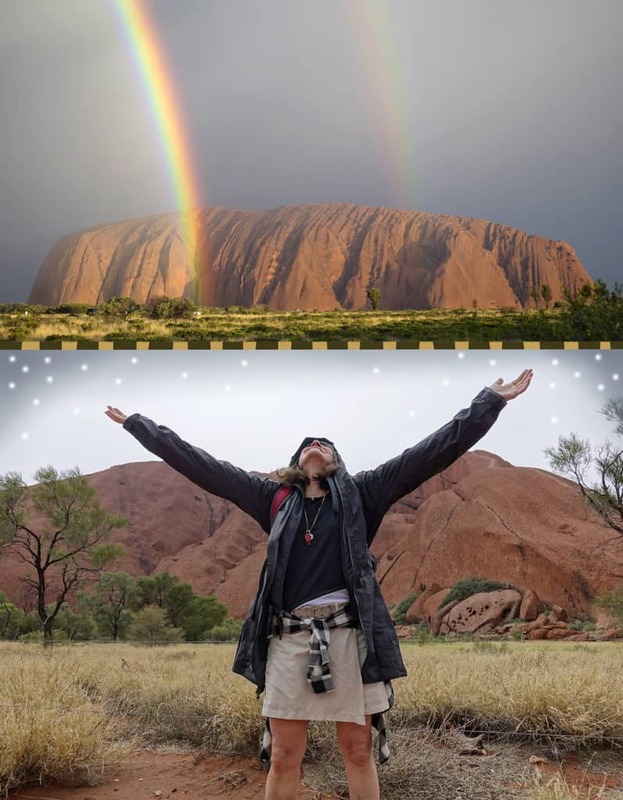 This entry was posted in 2017 and tagged #Miracle, australia, double rainbow, food is my religion, sacred place, spirituality, sunset at ayers rock, uluru on 2017/12/18 by Robin Botie. Wow! That’s sacred enough for me. Nature conspired with Marika’s passion to give you a momentary glimpse of the Other Side. I can imagine this as the peak of the trip, even if it only lasted a short time. Blessed New Year’s, Robin. I’m trying to figure out if this was the peak of the trip. Certainly, spiritually it might have been. But as far as emotional engagement, I keep coming back to my day at the Great Barrier Reef where it took every bit of energy and courage to go back into the surf again and again. I’m glad I’m not writing a proper manuscript of this trip because it’s painful to think in terms of narrative arc in this case. I loved my time there and am hoping to go back next fall. One of these days, maybe I could even really write about my adventures in Marikaland. Blessed New Year’s to you too, Elaine. Absolutely beautiful, and moving. Made me cry. Yikes! That wasn’t supposed to get published yet. That’s my post for Monday, Gayle. Sorry it made you cry on a weekend. I much prefer to make people cry on Mondays. I wonder if it will republish on Monday, the way I set it up to be? Things like this, when I mess up – that’s what makes me cry. I think I’ll go kick myself – I have no idea what I did to make this happen.